This is the 4th annual toy drive and we are so excited! Seven organizations are partnering on this year’s toy drive. We are looking for your help with a donation of new unwrapped toys for children of all ages. There are seven drop off sites around the city. Last day to donate is Friday, December 15th. The locations listed below will be accepting donations. On Saturday, December 16th we ask for your help in delivering the toys! We will meet at Boyd Motor Werks. There we will load up the toys and drive to Freeman Motor Company. There we will load up more toys and drive to Randall Children’s Hospital. Once there we will present the toys to the staff and take pictures. Sadly we are unable to present the toys to the kids. Join us for lunch afterwards! 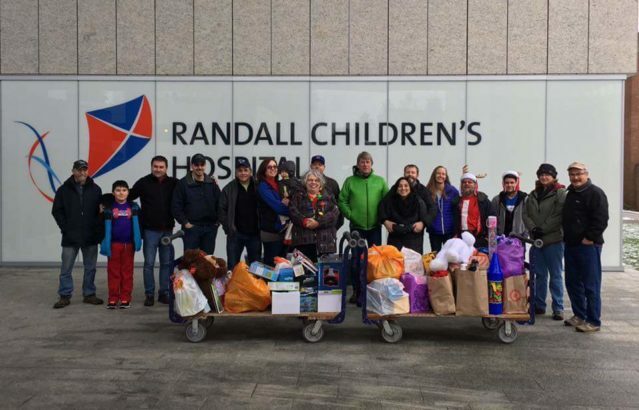 Randall Children’s Hospital is a state of the art hospital designed exclusively for children. It is the first Level 1 pediatric trauma center in the NW. It has the only inpatient rehabilitation program between Seattle and Oakland. It is unrivaled in its pediatric expertise and is located at Legacy Emanuel in Portland, OR.